Heat oil, add chopped onions or leek and mustard seeds. Slowly fry until the onion is soft. Add grated ginger, chopped chilli, curry powder and turmeric. Quickly stir into the onion mix. The mixture will be quite dry and you do not want it to burn. Take the pot off the burner and stir through the red lentils. Add water to just cover the lentil mix. Simmer until lentils are soft (usually 15 minutes). You may need to stir the mix occasionally and top up the water to avoid the dahl sticking to the base of the pot. An alternative cooking method that is typical of Nepalese lentil dhal allows you to omit step 2. All of the raw ingredients can be added to the pot, covered with water and cooked together. The frying process (step 2) adds another dimension to the flavour. Adding boiled water (step 5) to the lentil mix will decrease cooking time. Lentils are versatile ingredients that absorb the flavour of the dish, in this case the curry, turmeric, ginger, onion and chilli. You can modify the flavour by adding more or less of these ingredients. 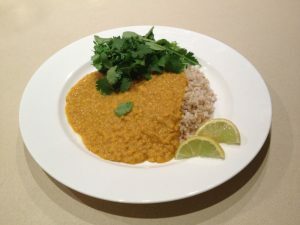 Red lentil dhal is a good source of iron, protein, phytonutrients and soluble fibre. Lentil dhal is traditionally served with rice and mixed steamed vegetables. It makes a hearty meal when served with mixed baked root vegetables e.g. pumpkin, sweet potato and parsnip.